Empowered Christchurch | Extensive report on liquefaction. Why has the worst affected land been left out of this report? Extensive report on liquefaction. Why has the worst affected land been left out of this report? Here is an extensive report on Liquefaction in Canterbury. Please keep in mind that liquefaction is not determined by silt or ejecta on the surface. These are byproducts of liquefaction. The most severe form of liquefaction is lateral spreading. My observation after having read this report is that I do not find it acceptable practices to exclude specifically areas that have groundwater higher than a meter. Large areas in Christchurch are affected by this problem and it is conveniently missed in this report. Much of this problem, not all, is caused by the earthquake subsidence. The highest groundwater reported on in this report is less than 2m. If a map would be produced for the areas that have water at less than a meter results would be much more severe than this report indicates. To compare here see groundwater following the September quake 2010. It is hard to believe that on the maps published the areas that are worst affected have simply been left out. 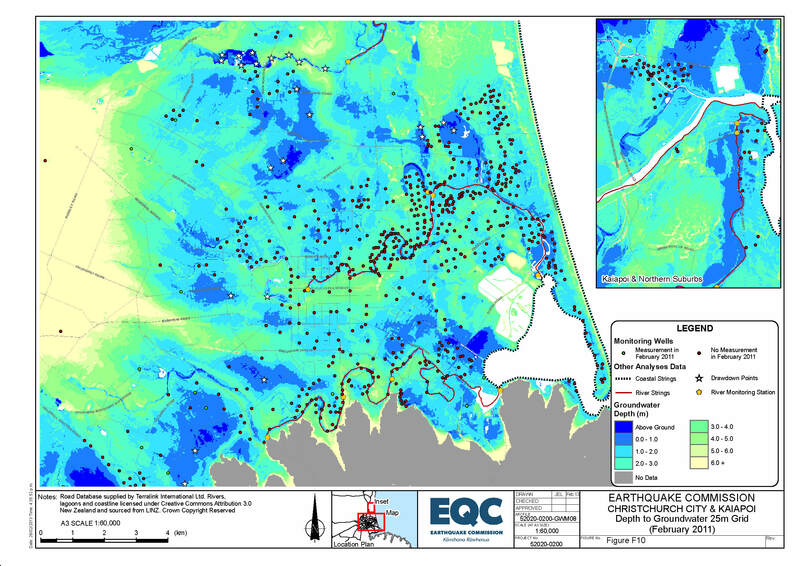 As you can see on the map below where I have combined the groundwater map and liquefaction map. You can clearly see that where the groundwater measures less than a meter from the surface hardly any measurements have been done. 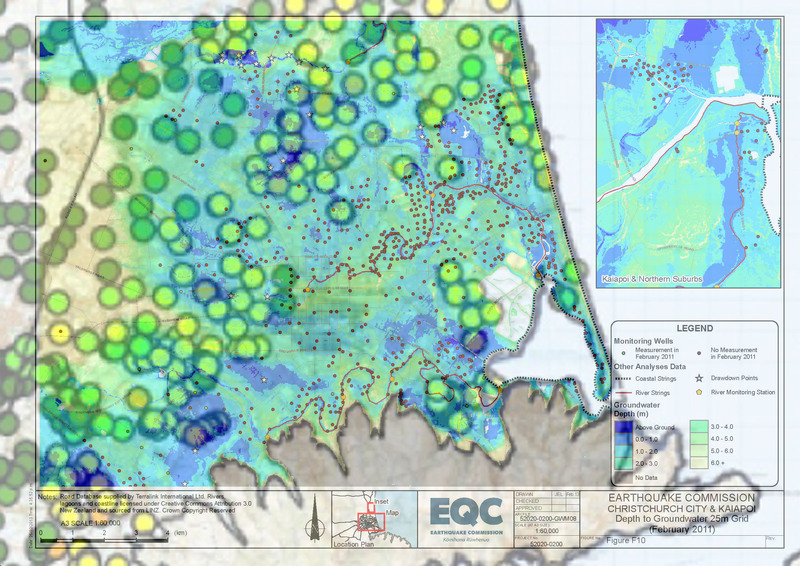 Why are these maps published as a reference for liquefaction and worst affected areas excluded? It is evident on the groundwater maps (not a part of this report) that crust thinning and loss of land bearing is a result of the earthquakes. Why are these properties not identified as increased risk of liquefaction? This entry was posted in Maps, Opinion, Publications & guides, Resources. Bookmark the permalink. Hi Hugo, this ties in well with my EQC land claim report, the data from which I received on Friday 8/82014. It shows no damage or liquifaction on my land. Incredible! The land is all liquifaction covered with bark chips so we don’t have to see it. I dig a hole in the back yard and hit water at 70cm. I have it confirmed that Council, Ecan and Department of Conservation are meeting over this area. There are some changes on the horizon. It would be sensible to hold back on decision for a few weeks as things stand.